Byzantine Ziggurat - the completed chapters. old [let down] waste game pages can be seen by clicking below. some links won't work, since they are from a previous chapter of the game. click here to see the old waste game pages. 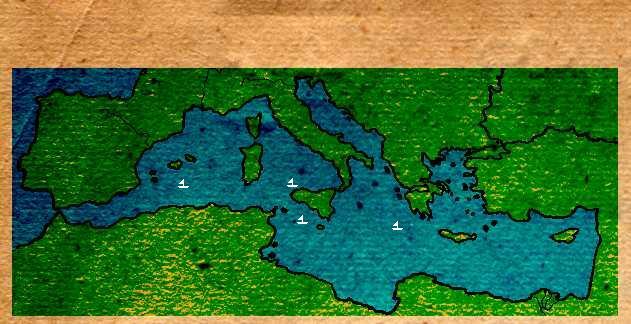 you click on the white ships and a picture pops up (see below) of a greek ship. written on the side of the ships are greek letters, some obscured by waves. the ships float around, and the page refreshes itself every minute automatically. when one of the ships "docks" at Crete, you can click on it and a password page pops up. there are password boxes, of various lengths, with greek symbols in front of the boxes. You can see the password pages below. Crete has the red oval around it in the map below. That's where the ships dock. The yellow "x" is approximately where ship1 (beta) usually docked, and passwords could be accessed then by clicking on the ship. artwork for the first four ships were taken from the link below. Link to translate greek alphabet (for symbols on sides of ships). Ship1 has docked at least five times, approximately at the point marked with a yellow "x" on the map up above. Other ships which touch land do not have a pop-up password window when clicked on(as of yet). 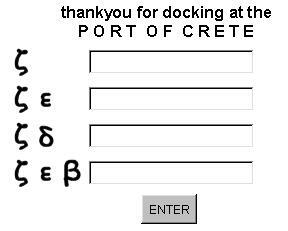 The only password entry page discovered thusfar is entered when ship1 or ship5 touches Crete. Click on ship1 or ship5 and enter your password(s?). the boat's docking time is changing constantly. the time range so far has been between 6 - 8:30 Central. All times listed as US Central Time. the ships remained at Crete for about 5-15 minutes then left. eventually, all ships docked. beta and zeta docked the most frequently. when a ship docked, and it's passwords were entered correctly, it disappeared. the person who docked it had their name placed on radiohead.com's byzantine ziggurat page. Click here to see the winner's page. HELP US ALL! we're trying to solve this. hopefully you are to. if you see anything missing that you might have figured out, CLICK BELOW and email me some info you've got! thanks everyone. Email [let down] with your waste-game info/theories.